My dad and I enjoyed watching television together. We had a number of shows we loved. He found Daria funny and satirical; The Young Ones silly and biting and You Can’t Do That on Television, a pleasant family-friendly little show. Roseanne, in the 1990s, was a fave. My dad and I especially enjoyed Roseanne, when the show aired from 1988 to 1997. It grounded in reality so much more than many sitcoms, ever. The show had so many writers, twenty-three, at one point, each with his or her own tee shirt bearing their number, slick tricks were not required. Roseanne and Jackie didn’t engage in silly get rich quick schemes, which were conveniently resolved by the end of the episode. Dan and Roseanne worked hard. When her boss, at the plastics factory pushed too hard, she and her friends quit and dealt with the consequences. Dan opened a bike shop and for a time it went well. When the recession, of the 1990s, hit the writers made the decision to follow reality. Dan went out of business. Most important, when daughter Becky decided she wanted to take her relationship with her boyfriend to the next level, intimacy, she was able to talk to her mom about it. Roseanne wasn’t happy about the situation. Still, she took Becky to the physician and got her birth control. Yet, consider the revival of the series now airing, in 2018. Roseanne is a Trump supporter! I have to wonder, why is that? Let’s look at the Conner Family. Roseanne is an Uber driver, Dan works hard; still, they have terrible medical insurance. In the opening episode, he returns from the pharmacy with, as he puts it: half the meds for twice the cost and they have to trade pills to make them last! In a recent episode, we learn that Roseanne has been over using opioids because of her bad knee. She needs surgery, but can’t afford the deductible. 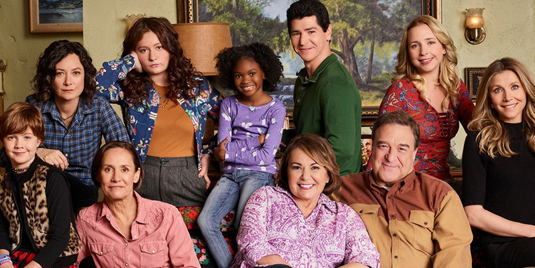 Roseanne has knee surgery, in a recent episode called, “Netflix & Pill,” although she has a secret stash of opioids to get her through procedure. What was that about Trump giving us better coverage? When was the last time he talked about improving our healthcare? I guess that’s for the future. On Roseanne, daughter Becky was always a good student. Today, she’s a bar server. College is out of reach, financially. Other daughter, Darlene and her two children live with Roseanne and Dan; she works at the local casino as a cocktail server. Her uniform is humiliating, but she needs the job; at least her casino job has medical coverage for her and her kids. Oh, and her son, Mark, a great kid, is, for lack of a better term, gender neutral; he has a strong interest in fashion. Grandson Mark is exploring his gender identity. Mark is exploring his identity, which Roseanne fully supports. Would Trump, whom Roseanne voted for in 2016, support Mark? Given how he talks of women, what does he do to help working women and moms? As I recall, in the original series, Roseanne got angry with her son, DJ, for not wanting to kiss a Black girl, Geena Williams, in a school play. In the new series, he’s married to Geena, they have a daughter; she is in the military, deployed overseas. Paging President Bone-spur: how has he treated our military and minorities? Bigotry is on the rise and crimes against Blacks and other minorities are in the news daily. Totalitarian Trump is getting his way, it seems. Just recently, some real trouble hit the Conner family. Dan, desperate to earn more money, put in a very low bid for a drywall job. He had to use non-union, illegal, workers to do it, which endangered his standing in his union, not to mention his friendship with a co-worker. Next, during a huge thunderstorm, their basement flooded. They were looking at real financial hardships before salvation arrive. The Federal Emergency Management Agency (FEMA), part of Homeland Security, declared the town, where the Conner family lives, Langford, Illinois, a disaster area. This meant FEMA funds would be available to help repair the basement. Dan realised he could do the home repairs himself for half the money and they could use the rest to pay for Roseanne’s knee surgery. Wow, what was it that Trump said about illegals? He has Immigration and Customs Enforcement (ICE) deporting people right and left; children, including babes in swaddling, separated from parents. Unions squeezed to the hilt. Yet, President Trump still wants his wall and, now, Americans will pay for it. The Conners needed a government program to bail them out, literally and figuratively. The Conner family need their fellow taxpayers to help them. The Conners can’t stand on their own two feet, it seems, and find the money to pay their bills. Does this make Roseanne and Dan takers? Are they lazy? Do they just need to work harder? Do they need to work longer? Do they need to work a second, third or even fourth job? Is Roseanne damning Trump with faint praise? Aren’t those all things dear old Don would say, does say on a regular basis? So, that’s why I have to ask Roseanne, why do you support him? Can anyone tell me? Is the revived Roseanne a way to damn the president to hell, subtly?